With personal attention and guidance, you can feel confidant that you are getting the most out of your exercise program. Our clubs offer an environment for women that is non-intimidating and provides stimulating music to keep you motivated. Our members are consistently mentioning their increased energy levels, improved appearance, and that they feel generally healthier. At Ladies Workout Express, any woman can participate and see results regardless of age or physical fitness level. The advantage of owning your own Franchise is that you will be in business for yourself but not by yourself. With more than 20 years of experience in successfully franchising health and fitness centers across the globe, the Lady of America Franchise Corporation has a proven system that has guided and supported more than 600 franchisees to success since 1984. From the start, our Franchise Support Team will be there to guide you through every step of your venture as a proud owner of your own business. Our expert staff works hand-in-hand with you in every aspect of the development of your fitness franchise. From assistance in training your staff, designing your marketing materials and providing ongoing daily operational support once your club is open. We will advise you on the best channels to take to acquire the financing needed for your specific situation and location. We will assist you by reviewing your lease. We will provide guidance during the interview process as you hire staff for your club. We will work closely with you during the build-out process and will help you oversee the scheduling and delivery of the products and equipment to your club. Our Marketing team and your Sales Coach will help you to implement and execute an advertising plan for your presale based on your demographic area. Your Sales Coach will help you to develop and execute your initial membership sales campaign. We will conduct this training onsite at your club. The LOAFC training program has been carefully designed by successful professionals in the health club industry. You (and ideally your manager) will attend <?xml:namespace prefix = st1 ns = "urn:schemas-microsoft-com:office:smarttags" />Health Club University, a comprehensive training program in Ft. Lauderdale, Florida, home of the Franchise Support Center. 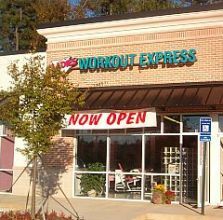 To learn more about the Ladies Workout Express women’s fitness franchise opportunity, simply complete the form below.